Off the Beaten Path: It's National Trail Mix Day! It's National Trail Mix Day! Saturday, August 31, is National Trail Mix Day ('cause we all need to celebrate granola and candy mixtures, of course). 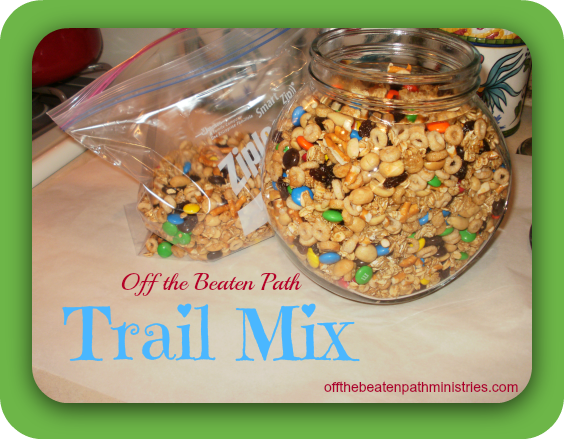 So what would Off the Beaten Path Ministries be without its own trail mix? Notta! I cannot hold a camera and stir or add or saute at the same time. I don't cook anything the same way twice. I am still using the Revereware cookware I received as a wedding present 26 years ago. And now, moving right along. Assemble the ingredients: butter, cheerios, granola, raisins, honey, nuts (I like peanuts), pretzels, and, of course, M&Ms. In a large Revereware pot with flippity-floppity handles, over low heat, melt butter; add honey until blended. Remove from heat and add cereal, nuts, pretzels, granola, and raisins, stirring until all pieces are evenly coated. Once everything is coated, spread the mixture onto a large cookie sheet with raised edges (so the mix won't fall all willy nilly into your oven!). Bake the mixture at 300 degrees for about 10 minutes and, note to self, do not over bake. Just M&Ms and raisins! Yum! Remove the mixture from the oven and spread onto parchment or waxed paper on the kitchen counter. Allow the mixture to cool completely, about 30 minutes or one complete episode of The Middle (the new season begins September 25th!). Poor the mixture into a large bowl (your absolutely largest bowl) and add the two cups of M&Ms, minus the handful you ate (I know you did!). Aren't they lovely? And yummy! Enjoy! Click here for your downloadable, printable, food bloggerable recipe! Have a happy National Trail Mix Day and a super non-laborious Labor Day weekend!